‘Spring Into Health’ week is drawing closer and we’d love to tell you about some of the great discounts we’ll have all week long, from Monday February 27 to Saturday March 4. 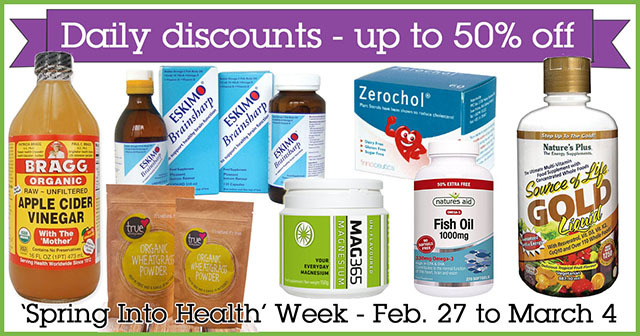 Our offers will change daily and will deliver you a massive 50% off some of our most popular products. There will be 33% off others. Either way, you can make big savings! We’re not like other shops who only give big discounts on things they can’t normally sell. Instead, we give our biggest discounts on the things we know our customers like best! So this is a great chance to either stock up on your favourites, or else try something new to see why so many others are using it regularly already. There’s all that and more during ‘Spring Into Health’ Week 2017 at Evolv Health & Wellbeing Store, Enniscorthy, Co. Wexford. It runs from Monday February 27 to Saturday March 4, and we’ll be open from 9.30 a.m. to 6 p.m. each day. Don’t miss out!